F. World 21 October 2015: Rabat: Pulling carts piled high with plastic bottles or rummaging through unofficial dump sites, informal trash collectors abound on the streets of Morocco. Dubbed "Mikhala" in the local Arabic dialect, the thousands of rubbish pickers are often looked down on as they trudge through the capital Rabat and other Moroccan cities. But a project to hire the Mikhala to work officially is starting to change that image, and even help as Morocco looks to reach an ambitious goal of reducing greenhouse gas emissions by 13 percent by 2020. 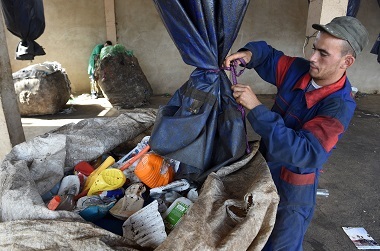 In their own modest way, the waste pickers could be a model for countries where, like in Morocco, consumers often...read on.